Gather round kiddies (kickball kitties?). This GMOT is a sad one. It was the start of October and Mother Nature was showing why she is a cold hearted [explicit word]. That night Hold My Beer And Watch This (HMBAWT) strutted to the field in their normal confident fashion armed with beer, rum cider and blue togas. We were lookin' fly and were ready to kick some balls, despite the arctic conditions.Unfortunately the team never warmed up (literally and figuratively) and we had some issues fielding. We're talking ball dropping, no communication and lots of confusion. It was basically like a bad middle school relationship, not enjoyable for any of the parties involved. Needless to say, if this doldrum tale hasn't clued you in yet, HMBAWT did lose that night. It could have been because of the giant pile of dog sh*t on field three, it could have been because Kaitlyn was "feeling Amish" for not going to the bar, or it could just be because the team was uninspired by Joline's weekly email (Mason even exclaimed "Michelle's are way better", as Joline was standing within earshot) She's tough though, no feelings hurt. Everyone can improve at something and for HMBAWT it was fielding this week! 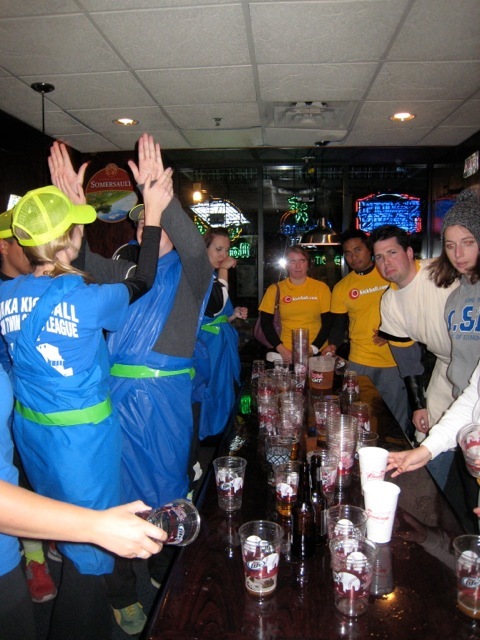 The true travesty occurred at the bar though when HMBAWT fell in flip cup for the first time in what seems like an eternity. It may have been because the cups were too tall (did you see them?! ), because the team was used to the cross-wind from the patio, or because we were all a little sleepy. Nobody knows ... But we do know that HMBAWT did win the themed week competition and maintained status as the "Most Fun Team" in WAKA-TC.